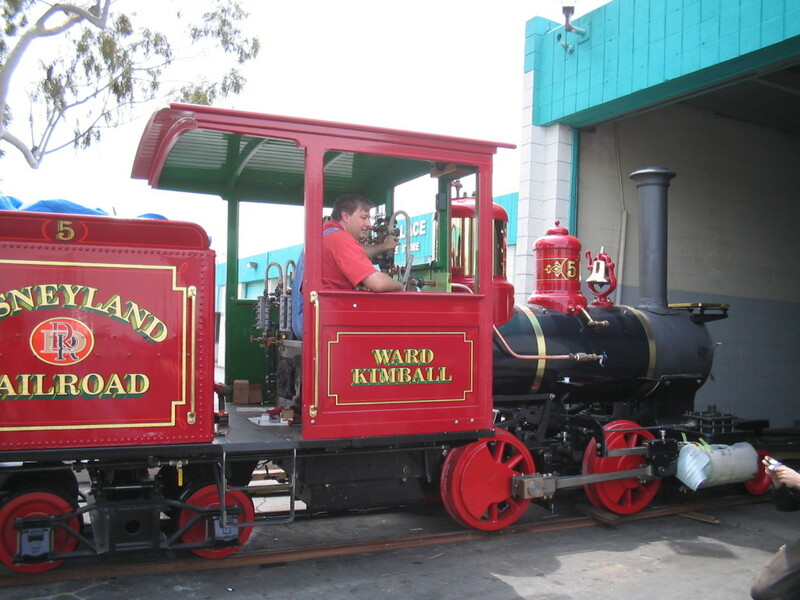 I just found a stash of old pictures during the completion and testing phases of the engine number 5, the Ward Kimball. Since the sim is also in its testing phase, I thought would be appropriate to share these pictures with you. You can also find some of these pictures in Steve DeGaetano’s “From Plantation to Theme Park” book. 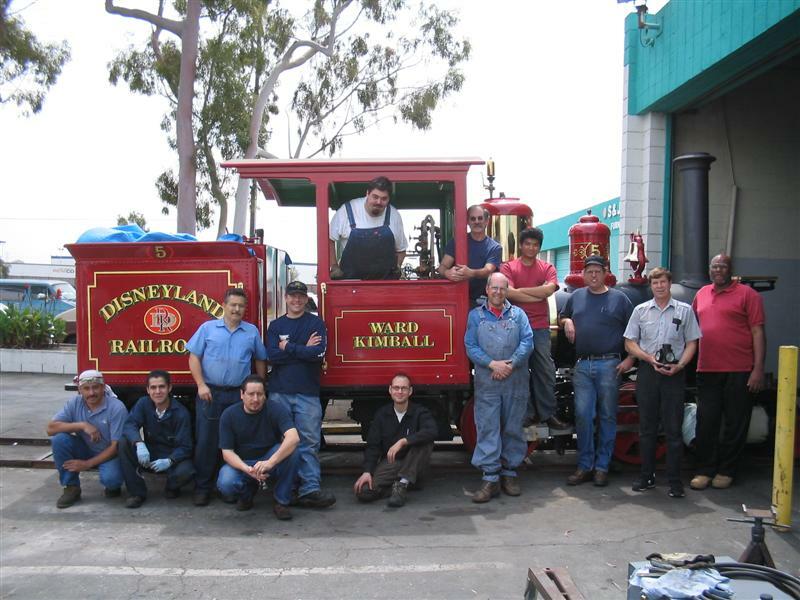 You might recognize this engine: it’s the Ward Kimball! But notice that she is without some of her ornaments and finishes: the headlamp, the pilot, the window panes, and the distinctive yellow stars on the driver. 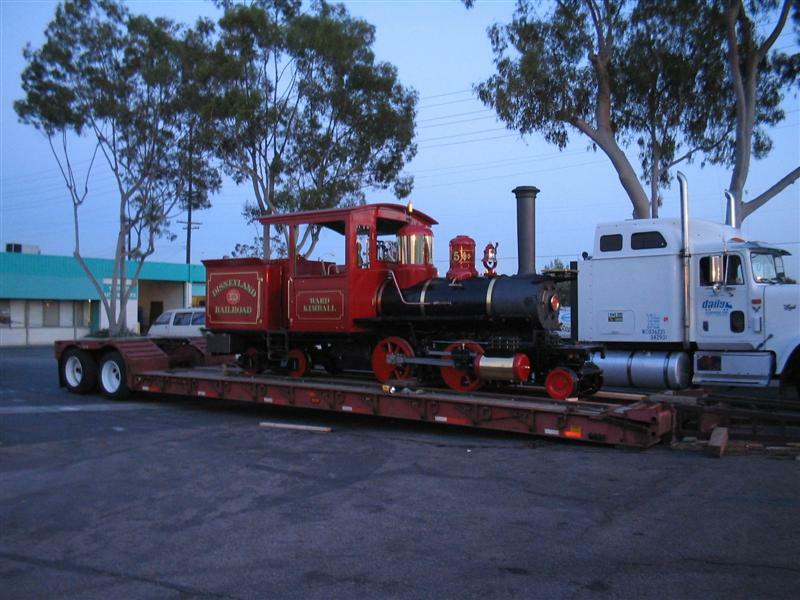 Above: the engine is loaded on a flat bed, and is getting ready for her trip from the BBRI shop to the roundhouse. Below: Paul Boschan poses for pictures in the engineer’s seat. Above: some of the BBRI crew and guests. 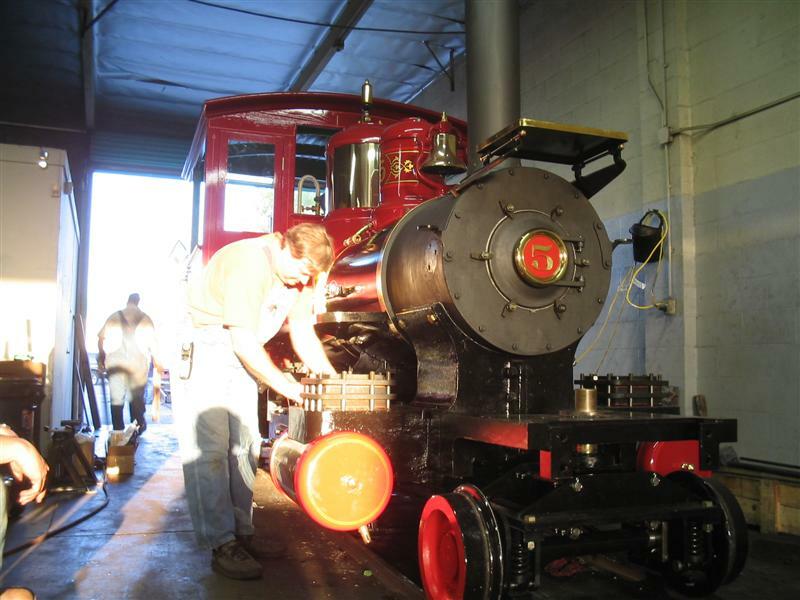 Below: Paul Boschan prepares the engine for loading onto the flat bed. A look at the mostly-finished cab head. 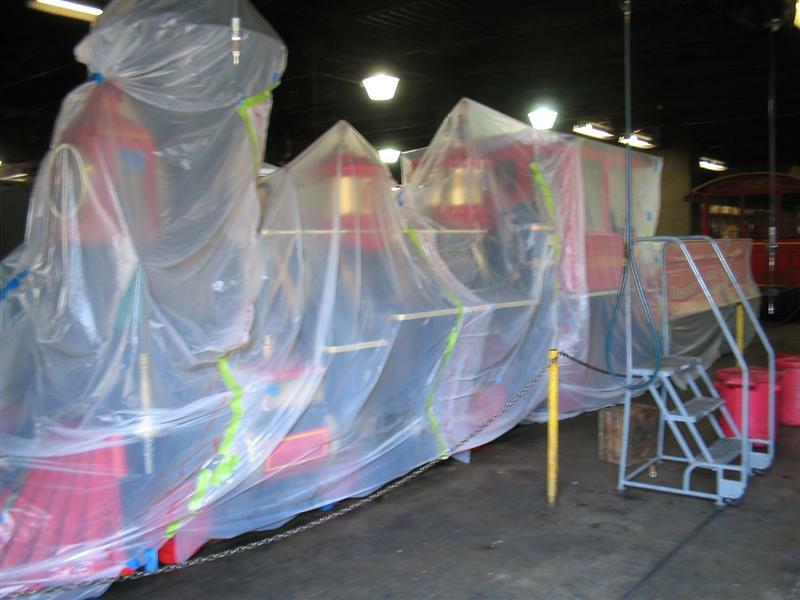 Your author was tasked with wrapping the steam pipes with protective cloth. Below: the engine arrives late under the cover of the night. 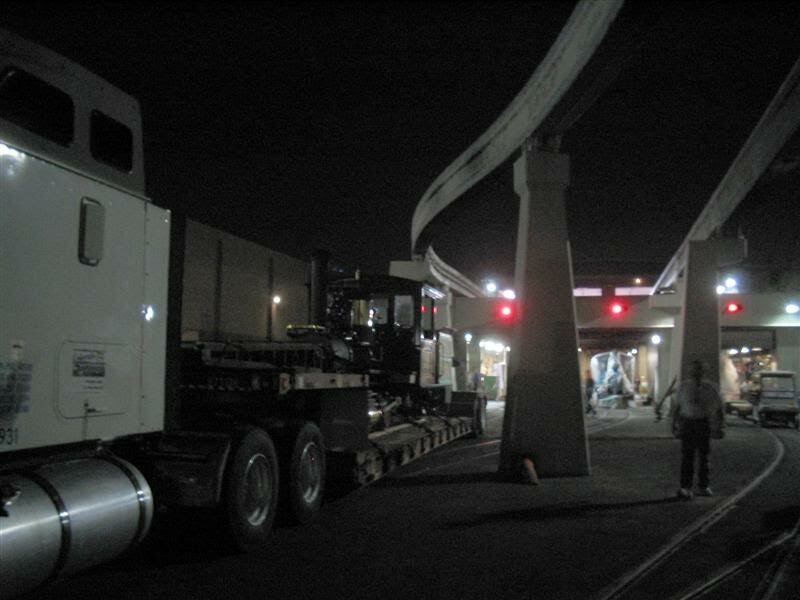 The crew encountered some difficulties maneuvering the long flat bed into position: there were cars parked in places where the truck’s long turn radius could not clear! 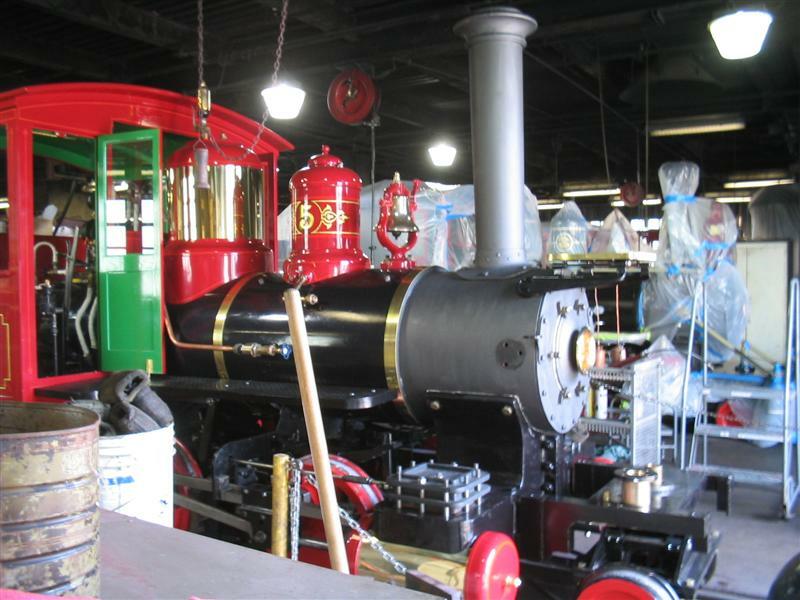 Above: The engine’s new and permanent home! 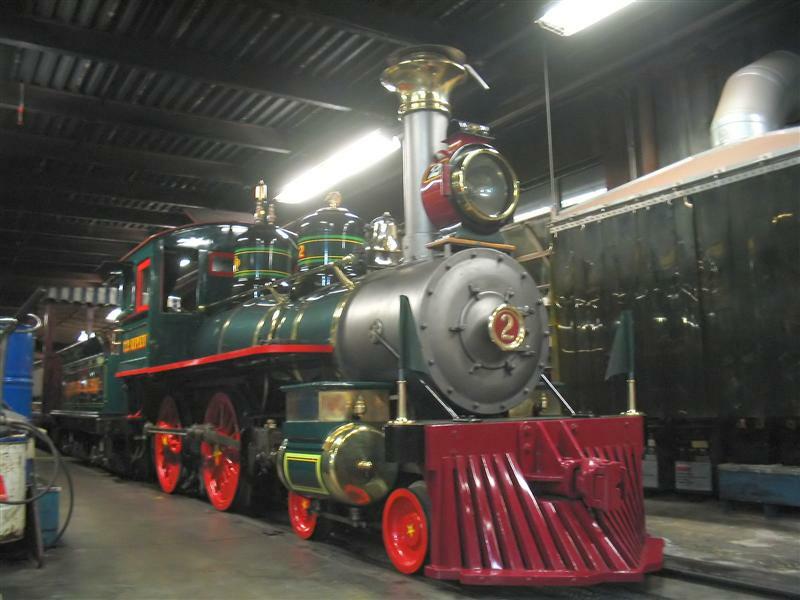 She’s in the roundhouse, undergoing some final finishing and testing. Note that she’s still lacking the finishing ornaments, hinting that her debut is still quite some time away from the date this picture was taken. 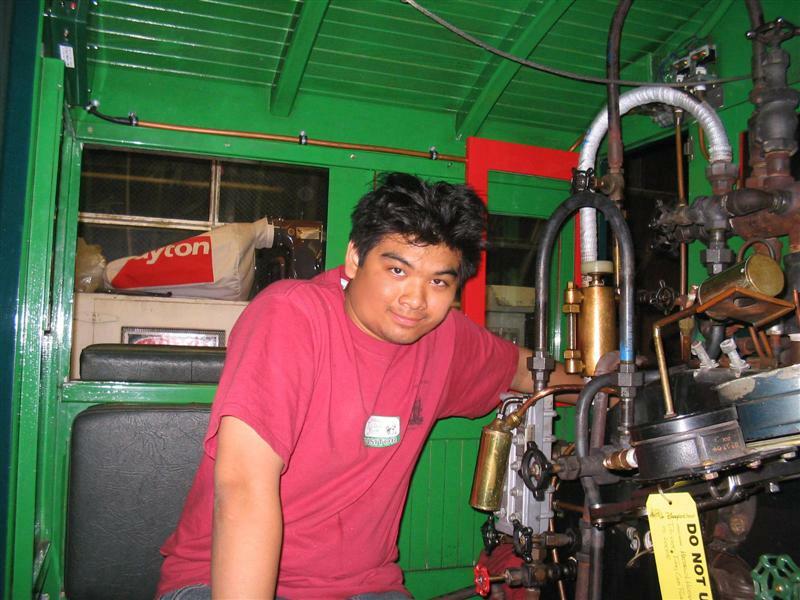 Above: author couldn’t resist not posing with the engine. 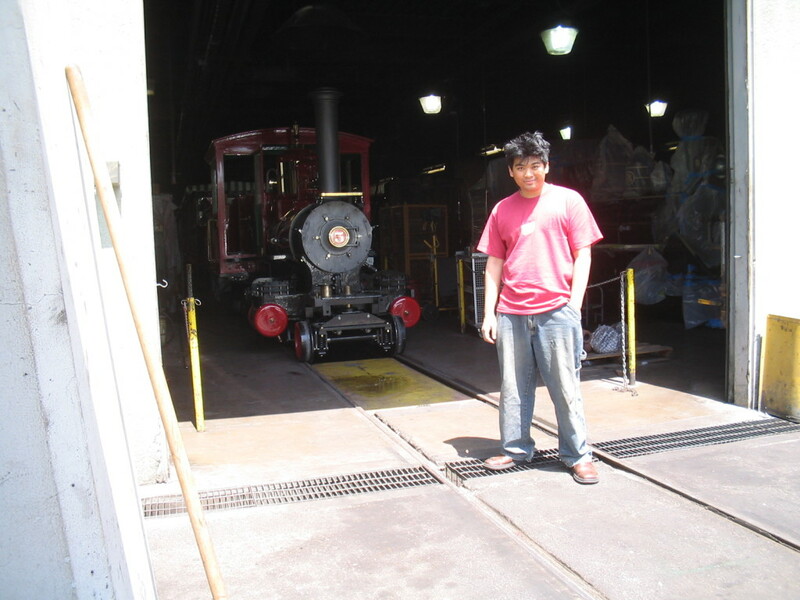 On one of the days I had some time to tour around the roundhouse after hours. You’ll see below that some of the engines were in quite a unique state! Above: all wrapped up—is it Christmas? There were some painting maintenance in the roundhouse: the number 1 and 3 were wrapped up with plastic sheet for protection from the spray paint. 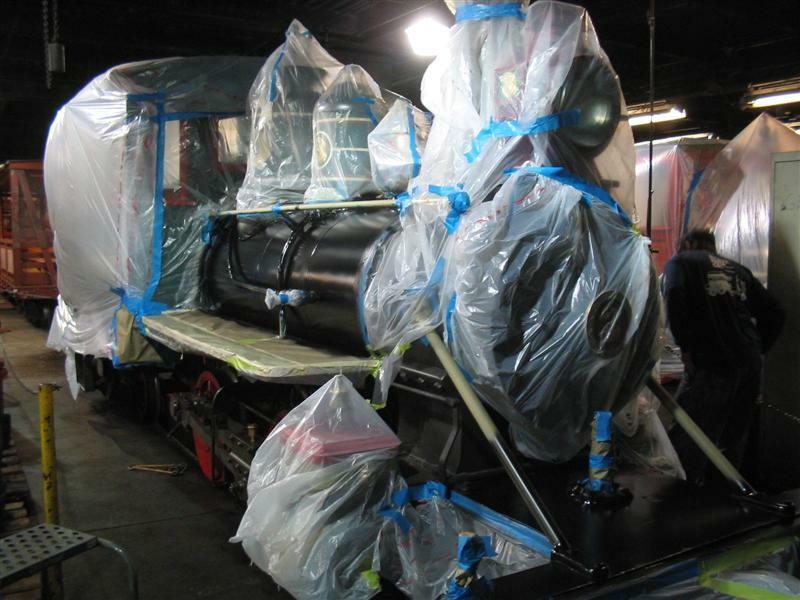 You can see the new paint on number 3’s boiler jacket. 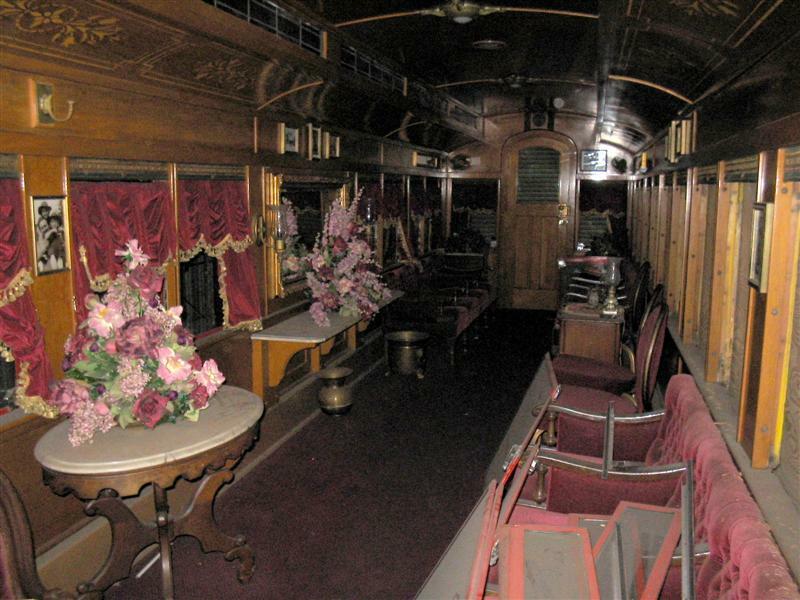 Below: the Lilly Belle coach was neglected and stored in the back of the roundhouse for a while, with her windows covered with plywood sheets. 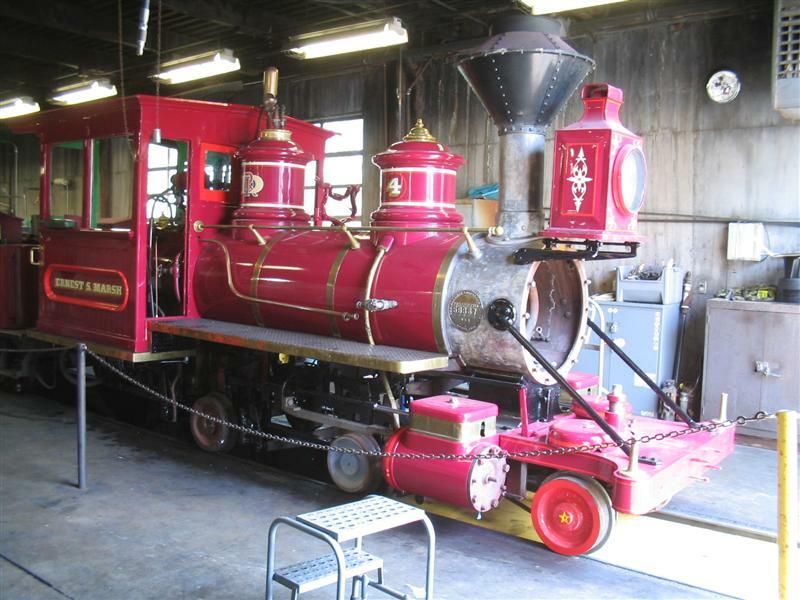 Matt Ouimet, the resort’s President at the time, was a fan of the trains and ordered for the restoration of the Lilly Belle. Now you can see and ride this historic car again. Above: author in the cab of the number 2, EP Ripley. 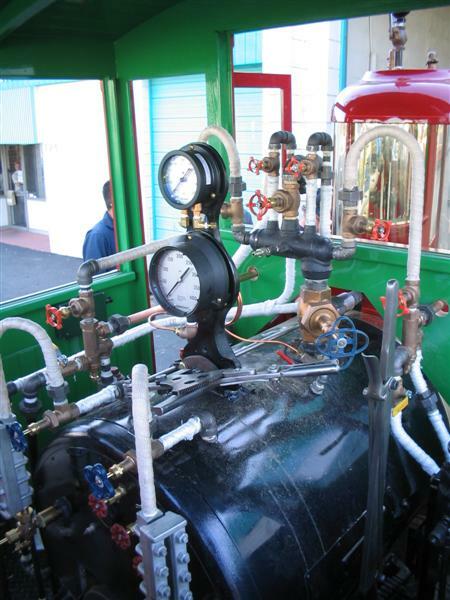 Note the missing boiler gauge. Below: EP Ripley hero shot. 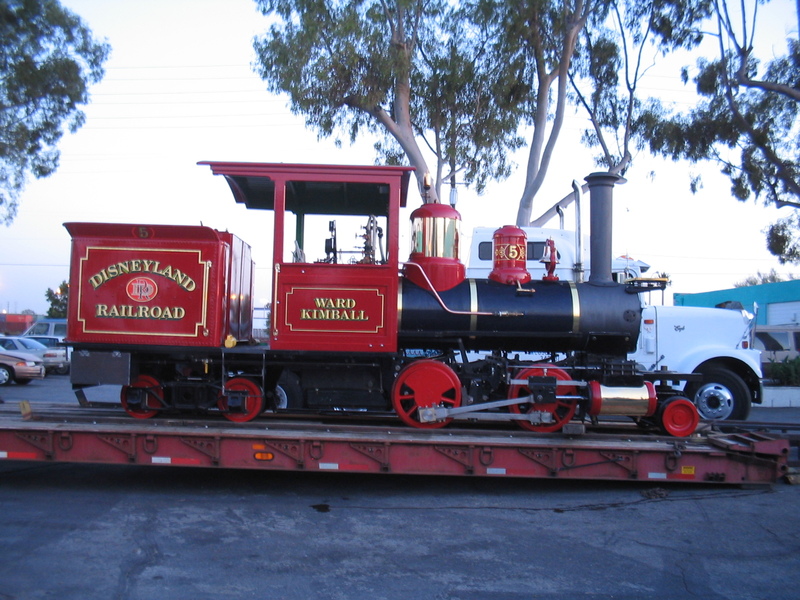 Above: the number 4 Ernest S Marsh with removed drivers and crossheads, smokebox front, and other accessories. 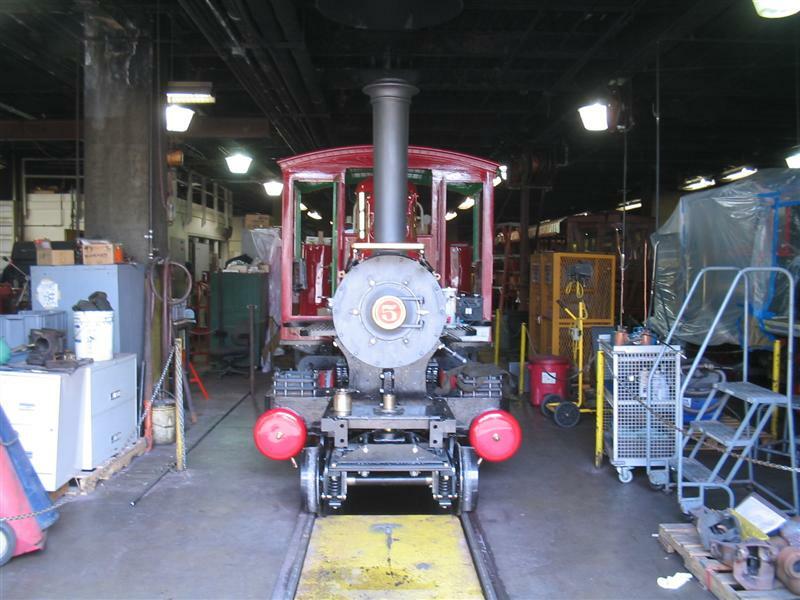 This affords a rare peek at the T-pipe inside the smokebox. You can see more pictures of the behind-the-scenes and read about the testing in Steve DeGaetano’s “From Plantation to Theme Park“.